Each spring many homeowners find dead, reddish-brown foliage on their evergreen plants including pine, spruce, fir, juniper, arborvitae and yew. The extent of the symptoms can vary from brown needle tips on one side of the plant, to one or two branches, to the whole tree. Injury is found on the outer portion of the branches and is often most severe on the side of the tree facing the wind or a source of radiated heat, such as a south or west-facing brick wall or street. Winter desiccation is a common type of winter injury that occurs when the amount of water lost by the foliage exceeds the amount picked up by the roots. All trees lose water during normal metabolic processes, even in winter. During the growing season when trees are in full foliage, large amounts of water are lost through their leaves. During winter months, photosynthetic processes are slowed, but evergreens continue to lose water at a higher rate than deciduous trees, through their needles and to a lesser extent from exposed bark, twigs and buds. Warm, sunny days or windy conditions increase the amount of water lost from the needles. If the soil is frozen or soil moisture is low due to dry conditions, plant roots are unable to pick up enough water to meet its needs. 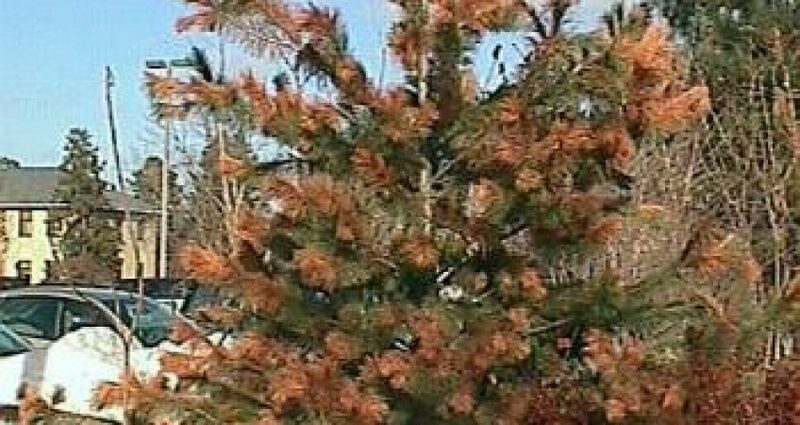 Needles dry out and die, but they may hold their green color until warmer temperatures arrive in spring, thus delaying the onset of browning symptoms. Winter wind accompanying dry periods can accelerate water loss from the needles, and needle death is more extensive on the side of the tree facing the prevailing wind. Other common terms for this type of injury are winter burn, winter drying or winter scorch. When water usage exceeds available water, the needles, leaves and twigs dry out and die. Usually evergreen leaves or needles hold their green color even after the injury has occurred until warm spring temperatures arrive, resulting in delayed browning symptoms. Affected needles turn yellow or reddish-brown at the tip, and dieback to the base. Often the pattern of damage is directional, on one side of the tree more than the other. Wind accompanying dry periods can accelerate water loss from the plant and result in damage that is more extensive on the side of the tree facing the prevailing wind, particularly those with southern or western exposures. Another factor that can contribute to a directional pattern of browning is solar radiation reflected from hard surfaces such as brick siding, pavement, light-colored metal siding or white lava rock mulch. Evergreen trees planted along streets may show browning of the foliage nearest the roadway. Foundation plantings of yew, juniper, dwarf Alberta spruce and arborvitae located around buildings show browning on the side next to the house. Factors that can predispose evergreen trees to winter desiccation are 1) white or lava rock around the base of the tree; 2) poorly develop root systems due to improper planting; 3) girdling roots; 4) root injury; 5) soil compaction; 6) stress due to insects or disease; and 7) tree genetics, i.e., trees from a southern United States source. No immediate action should be taken with evergreen plants showing winter injury other than supplemental watering if conditions are dry. Evergreen trees with a small amount of needle loss may still have live buds within the damaged branch sections. These buds will send out new growth and eventually fill in the damaged section in a few years. Evergreen shrubs, like holly and mahonia, may regenerate new leaves to replace the damaged foliage if injury was not severe enough to kill the underlying branches. Pruning- Wait until new growth has emerged before pruning out dead branches. After the new growth has emerged, prune out any dead branches or branch tips, cutting back to 1/4″ above a live bud. It is important to remove dead branches. They can provide an entryway for insects or fungi that attack the dead tissue. Summer watering- The key to preventing winter desiccation is to maintain adequate soil moisture throughout the summer and into winter. Provide damaged plants with one inch of water per week, allowing them to growth vigorously and avoid further injury next winter. Trees that have suffered from drought conditions at any time during the year will not be able to withstand dry winter conditions as well as trees that have consistently received adequate moisture. Winter watering- Many people put their water hoses away for the winter, but periodic watering during the fall and winter at times when the ground is not frozen can be very beneficial. Trees and shrubs benefit from slow, deep watering with a hose that has been left to trickle for an hour or so. Turfgrasses also benefit from a periodic deep watering. Mulching- Apply a 3-6 foot diameter ring of mulch around the base of trees and shrubs, with 3-4 inches of an organic material like coarse wood chips. This helps conserve soil moisture and prevent deep freezing of the soil in winter. Relocation- Susceptible trees and shrubs may be protected from prevailing winter winds next year by erecting a lath or burlap screen on the south or southwest side in fall, or by transplanting them to a more protected location. Loss of trees due to winter injury is unnecessary and costly, not only in monetary terms, but in intangible values such as shade, protection and beauty. Since Nebraska frequently experiences dry fall and early winter conditions, deep-watering trees in fall may mean the difference between healthy, vigorous trees or stressed, struggling trees next spring.